Catherine and Graham were married on a perfect July day. When we first started talking about the big day, Catherine had an inspiration picture that we used as a guide to bring their big day to life. A beautiful color scheme of ivory, beige, pale blush, peach and minty greens. As we got closer to the day we started really focusing on the little details that would make for some fun photos and great memories. Catherine let us have fun with her bouquet handle and we fashioned a fabric rosette with silk shantung and a glittery 'B' for her 'new' last name. I'm a sucker for trailing ribbons and I was so thrilled we got to adorn the handle with more silk ribbons in soft, sandy colors. 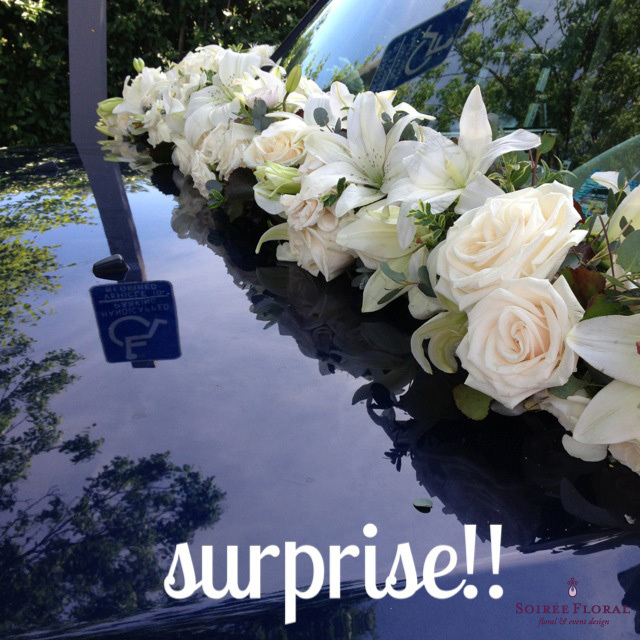 Grahams parents called us with a special request to surprise the couple after the ceremony with a garland draped on Graham's car. We were happy to oblige. We saw that garland several times driving around the island that weekend - a fun reminder of the perfect weekend for a very special couple. We enjoyed every minute of working with this fun family.